How ironic that the big idea behind Downsizing is the victim of such small ambitions. Director Alexander Payne’s low-energy observational dramedy proffers a near-future in which a person can be shrunk to 5 inches tall in a bid to conserve their finances and, in the process, significantly reduce their carbon footprint. But Payne all but abandons the global impact of this extreme response to over-population practically the moment Matt Damon’s occupational therapist Paul Safranek undergoes the irreversible procedure and moves from his Nebraska hometown to a downsized community in New Mexico called Leisureland Estates. For Payne, the intriguing premises he concocts with co-screenwriter Jim Taylor for Downsizing is just an another excuse to explore one middle-age (white) man’s existential crisis in a world he does not understand or appreciate. 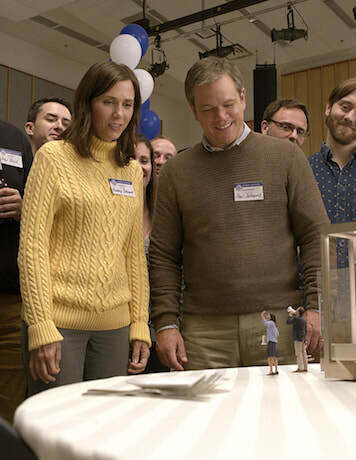 Payne does return to Downsizing’s initial concerns late in the film, but by then whatever statements he wants to make about humanity’s relationship with Mother Nature is lost to the self-suffering and insufferable Paul’s efforts to find his place in a new society that inevitably ends up resembling the one he left behind. Prior to moving to Leisureland Estates with the best of intentions, Paul is a nice and considerate fellow who wants to make the most of his meager salary and savings. But Paul’s wife Audrey, who is played with sufficient hesitancy by Kristen Wiig, gets cold feet and backs out of being downsized. A year later and a now-divorced Paul has become a pitiful bore who refuses to take advantage of everything Leisureland Estates offers. A curiously bland Damon is mildly reactive at best, unengaged at worst, even after he’s seems to have found his life’s calling. It’s impossible to root for Paul’s happiness because Damon doesn’t seem to care about Paul or his predicament. Part of this problem lies with Payne and Taylor’s script, which presents Paul as a dull everyman whose journey of discovery is equally unremarkable. Payne, whose intricate character studies include Election, Sidewaysand Nebraska, never finds a way to make Paul as interesting as his circumstances. He also has trouble deciding whether he’s making a comedy that’s informed by current green politics and social ills. While Rolfe Kent’s jovial score suggests Downsizing is supposed to be played for laughs, Payne can’t find much humor in his premise. At the same time, Downsizing lacks dramatic tension. The film just sits there waiting in vain for its director to give it an identity. Only Christoph Waltz and Hong Chau seem to believe that are in a comedy. Waltz thankfully chews it up as Paul’s bigger-than-life neighbor Dusan Mirkovic, a party-hard hustler with a conscience. Chau suffers no fools as the comically blunt Ngoc Lan Tran, a Vietnamese dissident whose arrival at Leisureland Estates is clouded by controversy and eventually opens Paul’s eyes to the economic disparity that exists outside the community’s walls. Chau imbues her angel of mercy with enough empathy to fill every McMansion in Leisureland Estates. Chau and Payne work hard to ensure Ngoc is just as much a fully realized character as she is a symbol of the immigrant experience in the United States. But when Ngoc’s story becomes overshadowed by Paul’s story, it’s evident Payne would have been better served had he told Downsizing through Ngoc’s eyes. Ngoc deserves more than Paul or Leisureland Estates can offer.